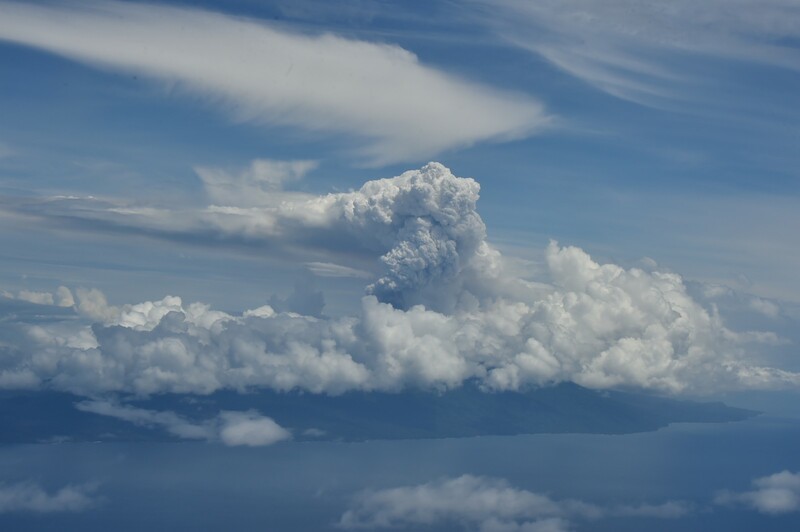 A New Zealand Defence Force aerial survey on 26 March found Vanuatu’s Manaro Voui volcano emitting huge columns of smoke. The New Zealand Defence Force (NZDF) has conducted aerial surveys of two volcanoes in the Pacific that are showing signs of renewed activity. The survey, requested by GNS Science, included Monowai, an underwater volcano north of New Zealand, and the Manaro Voui (Ambae) volcano in Vanuatu, Air Commodore Andrew Clark, the Air Component Commander, said. “Imagery taken by a Royal New Zealand Air Force P-3K2 Orion aircraft will help authorities assess recent volcanic activity, especially of Manaro Voui volcano,” Air Commodore Clark said. The eruption of Manaro Voui volcano started last September, prompting Vanuatu authorities to raise the volcanic alert level to 4 — the second-highest alert level — and to order all 11,000 residents of Ambae island to evacuate immediately. The residents returned when the level of volcanic activity subsided in October. GNS Science said the vigour of Manaro Voui’s eruption increased over the past seven to 10 days, with fresh ash falling and acid rain reported, affecting crops, water supplies and some buildings. GNS Science and New Zealand’s Ministry of Foreign Affairs and Trade are supporting the Vanuatu Meteorology and Geo-Hazards Department in responding to the eruption. The Monowai submarine volcano in the northern Kermadec area is also frequently active and GNS Science found evidence of volcanic activity in seismic data in recent weeks. GNS Science volcanologist Brad Scott said it was extremely important to monitor active volcanoes because their eruption could have huge impacts on the safety and health of residents, the environment and the economic and business sectors. In recent years the NZDF has conducted aerial surveys of volcanoes in Vanuatu, Solomon Islands and Tonga, after requests from these countries. Together with GNS Science and MFAT, it has also helped Pacific countries develop their capability in responding to volcanic activity.